Another painful, boring day for the ClashManiac, BH4 game. 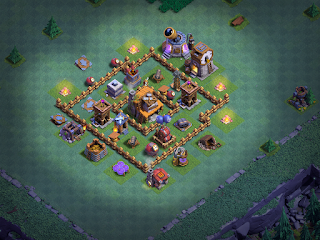 Today had one purpose and one purpose only -> get enough gold to upgrade the elixir storage. And that is exactly what I did...and the only thing I did. It took several attacks, hovering on either side of 1000 trophies, but I was finally able to win 3 and get enough loot to upgrade the elixir storage. I also have 170k in elixir that I will hold onto until my next set of raids, just to ensure I get enough to buy the fourth army camp. BH4 is a bit of a conundrum right now. To be perfectly honest, I do not see a clear upgrade path for BH4 and I'm not convinced maxing or rushing are better either way even. So...I got caught up in the new Pokémon Go gym game Sunday and before I knew it, all of Day #6 was gone and I hadn't played my CoC BB game at all. The good news...the BH4 upgrade finished! The bad news...it finished before I could refill my storages as a BH3. Oops. Needless to say, Day #7 was a bit challenging. The very first thing I needed to do was to get the elixir storage upgraded so I could get the fourth Army Camp. I had pushed to 946 trophies, which meant 170K in resources for each set of lootable attacks, maybe a little more if I could reach above 1000 trophies. 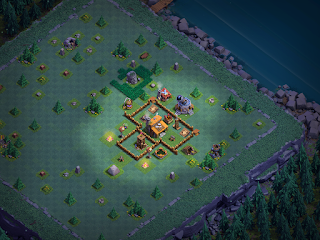 I was able to get my BH3 game up to 889 trophies on just two army camps. Today's lootable attacks went live so I started working on getting my third army camp. And I lost every single battle down to 798 trophies. I did not win a single battle for the better part of half an hour and every opponent was a BH3 game. I can honestly say I have NEVER had such a bad losing streak across all six of my games. The problem was the walls and armaments at the 800-900 trophies level. 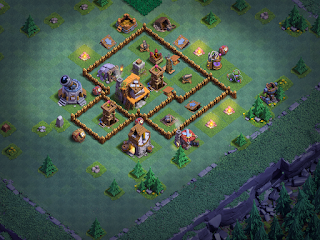 Even with level 4 Giants, two simply could not break through the walls before they were decimated. Base designs with spring traps would easily wipe out the Giants as well and having only six archers...that was bad. Day 3 is about as boring as this game can get. My Clash Maniac game is still so low in the trophies that I won't be getting much loot until I have the troops to trophy push into the 1000 range. I ran a whopping five attacks; lost the first two, then won three in a row for 115,000 in resources. I upgraded my elixir storage so I would have enough storage for the camp upgrade. I then upgraded my Giants two levels and unlocked Minions in the Barracks. That sapped both the elixir and most of my gold right there. I did take the opportunity to use a little for resource collector upgrades as well, though. The remaining gold I held onto for buying the Crusher tomorrow. Only thing left to do now is trophy push a bit. Additionally, you'll need to clear some debris from the game grid to be able to build a decent base. Needless to say - this is NOT a one day game without using gems. If I do well, I'll get 30,000 in resources on 2 attacks, then 45,000 on my final attack. That's 105,000 in Gold and Elixir for today's loot. Prioritization is key to making it through the next couple of days. 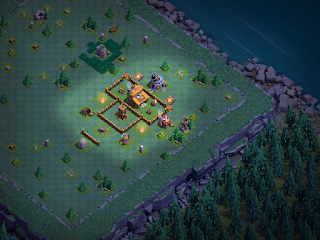 I'd forgotten how little you get when first starting a game of Clash of Clans; the Builder's Base is no different. 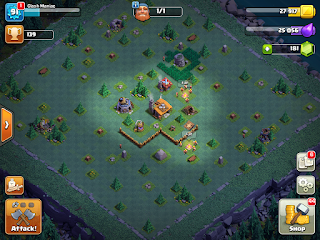 The game begins with one barracks, one army camp, one cannon, a couple of walls, and your first gold mine/elixir collector. The reality is that there's not a whole lot you can do with so little and this is by design. On the plus side - you'll get SIX loot generating attacks, so you can at least wrap a maxed BH2 at the end. Your first run of attacks will be a bit rough. You have 4, level 2 Barbarians in just a single camp; that's not a lot to work with. Of course, your opponents will typically have no more than a single cannon for you to contend with so if you're a bit smart about it, you can always get 100% and just wait for the opponent who drops his troops in the wrong place. Ok - it's been a while since I posted anything and, to be frank, I just haven't been playing. I know - it's hard to believe that a Clash junkie like me would take several months off but let's be honest - the grind is just boring and SuperCell (SC) hasn't brought us any decent, new content in nearly a year and a half now. A few months back, the energy started building around a new update that was going to hit in the April-May time frame. It was going to be huge - earth shattering, even. The YouTubers hyped the heck out of it and even SuperCell dropped lots of hints around how great it would be. Word on the grapevine was that this was a real game-changer that would bring new content to CoC and rejuvenate the game.